Where to start? This was the daunting question I faced after I challenged myself to 3 goals. Locally I found very little information about the Wyoming. The first book I discovered, with any significant information about the Wyoming was “American Sailing coasters of the North Atlantic” by Paul C. Morris of Nantucket. Wanting more information or be pointed in the right direction to further my search for answers, I called Mr. Morris on the telephone. His extensive knowledge and willingness to share information got me started in this pursuit for answers. I never thought I would get as far as I did. I received a lot of help from the many people listed in my acknowledgements. 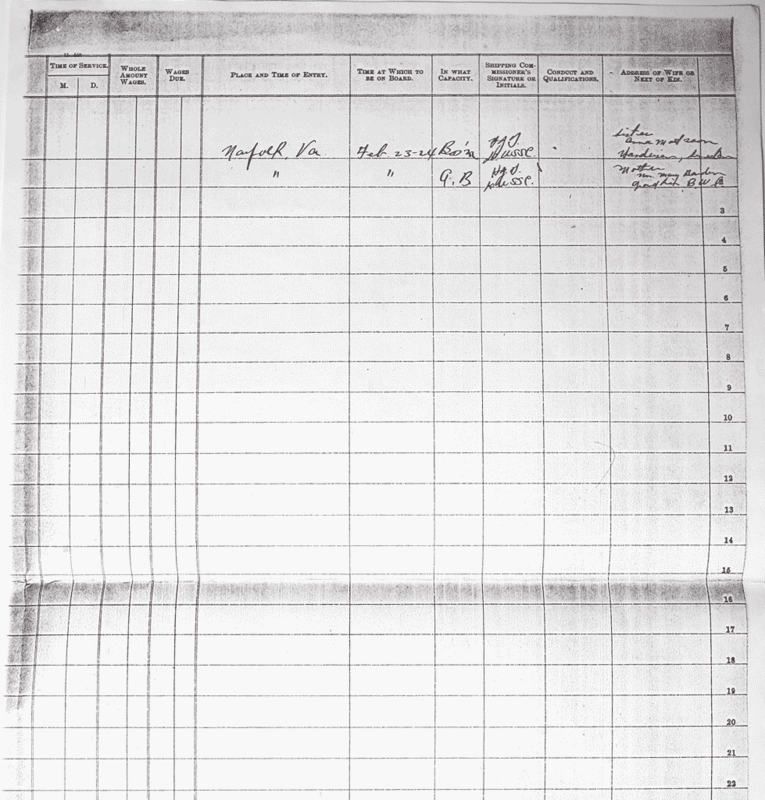 As for my 1st goal, Who was on the Wyoming when it was lost in March of 1924? I came very close to answering this question. 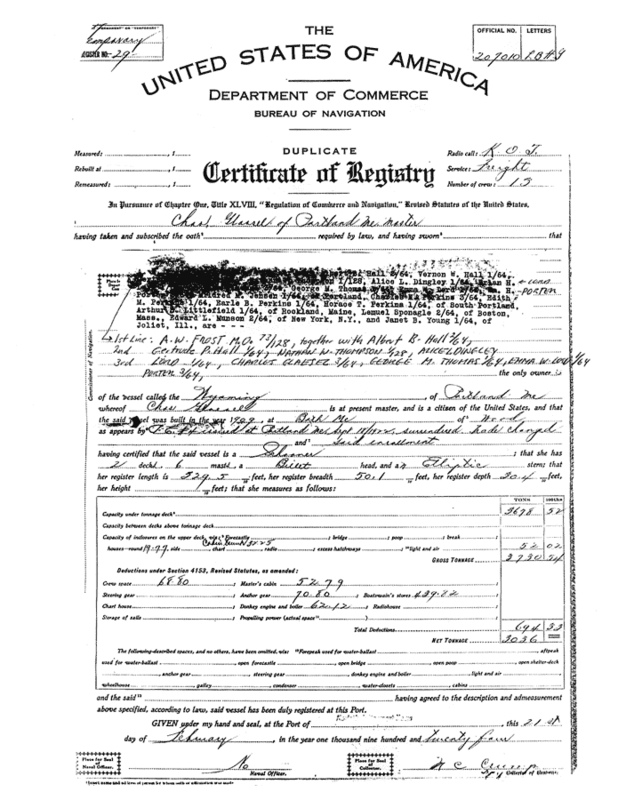 The Certificate of Registry for the Wyoming in Norfolk stated that it had a crew of 13 and the present master being Captain Charles Glaesel. 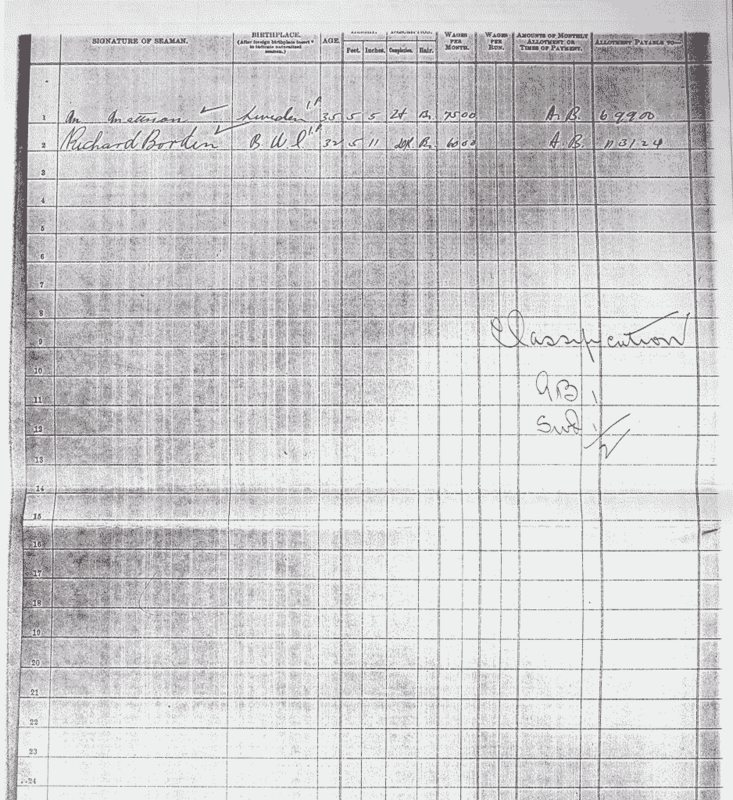 On March 28, 1924, in the surrender portion of this document, it was written, “14 person aboard, 14 lives lost. I could find the names for only 12 crew members and their position on the ship. Captain Douglas Lee of Rockland, Me, who has a vast amount of information about the Wyoming, suggested that the 13th crew member was probably a cabin boy or steward. He told me that most captains of that time period had a person in this capacity. I could not find any document or news article that listed this position or a person, by name, for the 13th crew member. However there is doubt in my mind, that there were 13 crew members on board that final voyage, but if so the 13th person was indeed the cabin boy. I found the names of the 2 crew members who boarded the ship in Norfolk to replace the 2 who left the ship. The problem I alluded to on the Home Page, was I could not identify the person who got off the ship with my father. The 2 who boarded the ship in Norfolk, one was an able bodied seaman Richard Borden. I do not think it is unreasonable to assume he was to replace an (ABS) that left the ship. 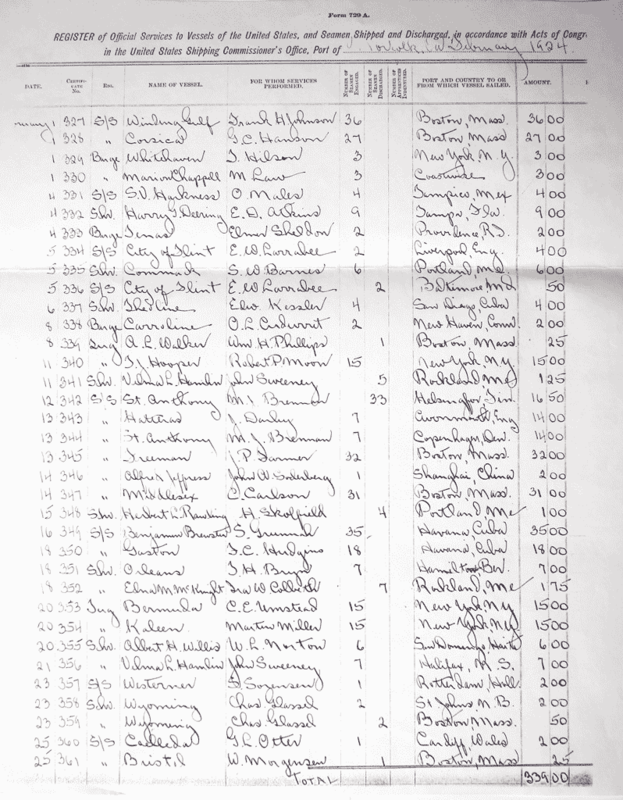 Two of the 8 able-bodied seamen from Boston to Norfolk were from the Norfolk area, so I have made the assumption that either John Medina or Antonio Santos survived the fate of the Wyoming disaster on the 2nd leg of its last voyage, as they were probable getting a passage back to their home port. 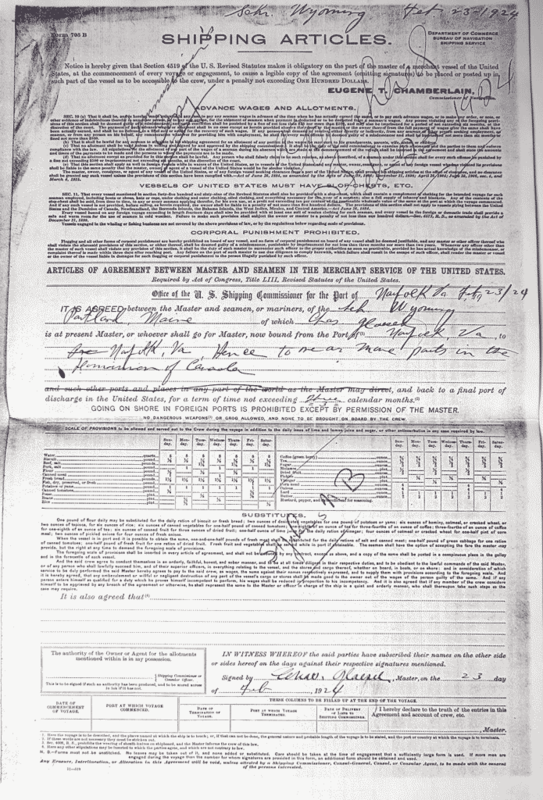 By putting this information on the internet, I hope someone reading this will remember a story their father or grandfather told them of being saved from the Wyoming’s fate, or maybe a census record in the Norfolk area could provide information on the existence of Medina or Santos after March of 1924. As for goal #2, Who replaced my father in Norfolk? I am certain that An Mattsson was my father’s replacement. However, this presents another question. My father was the cook, The Shipping Articles of Norfolk state that Mr. Mattsson was brought on board in the Capacity of Bosun. If so, Who was to be the cook on the voyage to Canada? Goal #3, Was my father’s story on how he left the ship in Norfolk, the only reason ? The answer to this is strictly speculation, based on the abundance of information I received. I do not think Captain Glaesel misled my father. From everything I found, the captain was an honorable man, well liked, and respected as a Captain and a person. I think there really was an initial delay of the Wyoming in Norfolk. 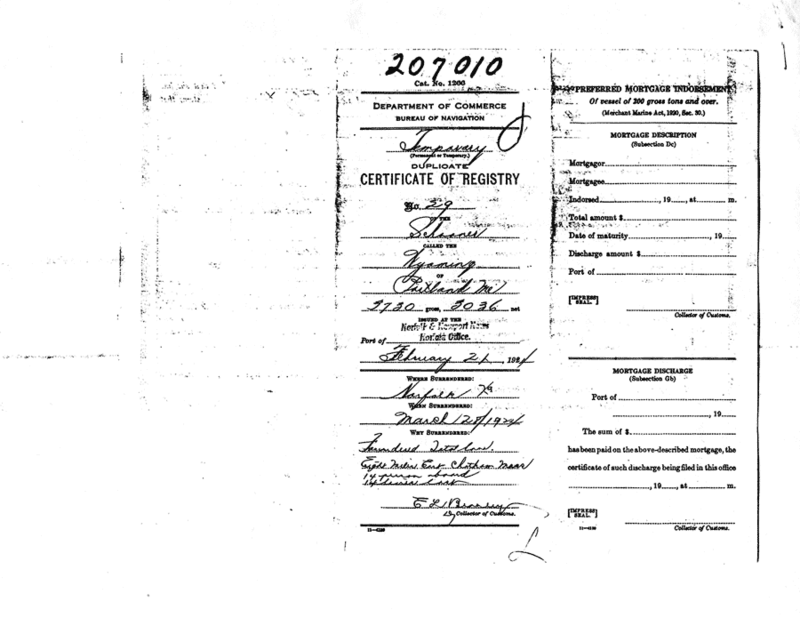 As seen in the document, Register, port of Norfolk, of Seaman Shipped & Discharged, 2 men departed and 2 men boarded the ship on Feb., 23, 1924. The delay was probably cleared up after this date, so the Wyoming got under way and left Norfolk on Feb., 29, 1924 with the 2 crew replacements already on board. Anyone wishing to contact me about the information or accuracy of this web site, can email me at LLOYDPED@SchoonerWyoming.com.